JAMESTOWN, N.Y. -- Did you hear the one about Bob Hope, Rodney Dangerfield, and Andy Kauffman performing on the same stage? It might not be a joke once the National Comedy Center opens its doors. Plans for the museum in an out-of-the-way city in western New York include a hologram comedy club that will put visitors in the audience for classic routines of comedic legends. Developers aren't ready to release the "performers" yet but say dozens of the late greats are in the mix. It's all part of a plan to ask not just what's so funny, but why. 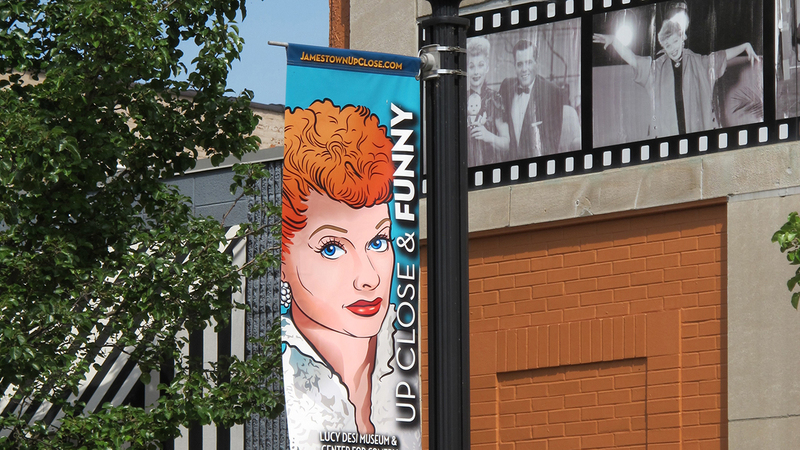 The center planned in Lucille Ball's hometown fulfills the late comedienne's wishes that humor in general be honored, not just her, daughter Lucie Arnaz said. "She didn't want anything like a statue or something sort of dead or lifeless," Arnaz said by phone from California. Although her parents would be flattered by the Lucille Ball-Desi Arnaz Museum that went up dedicated to their show biz careers, she said they would be even more thrilled by the new comedy center breaking ground this summer and expected to open as early as next year. "It's not just about Lucy, it's about everybody, that's what I love about the center," said Arnaz, who along with her brother Desi Arnaz Jr., Jerry Seinfeld, Carol Burnett, Paula Poundstone and Dan Aykroyd, are among celebrities who have given the plans a thumbs-up. The hologram comedy club will open in a partnership with Hologram USA, the firm behind the late Tupac Shakur's 2012 "live" performance at the Coachella Valley Music and Art Festival. The company is in discussions with the estates of numerous comedians who could be featured, a spokesman said. Also on the drawing board are a comedy "boot camp" offering how-to instruction on joke delivery, a writer's room experience that peeks at the process behind groundbreaking comedy, and perhaps a heckle booth for the brave who, after being given jokes, think they could resist being thrown off their stand-up game. Local Projects, the media and architecture design firm behind the 9/11 Museum media design, along with Jack Rouse Associates, are other creative forces. "Everyone should go to NCC and walk out knowing more about how they're funny, why they're funny, what makes them funny," said Local Projects founder Jake Barton. With nearly an acre (0.4-hectare) of exhibition space, the new center will occupy the restored art deco Jamestown Gateway Train Station, a former city-owned utility building and a new connecting building in between, said Journey Gunderson, executive director of the nonprofit National Comedy Center Inc., which also oversees the existing Lucy-Desi museum. Lucille Ball "wanted Jamestown to celebrate all forms of comedy," Gunderson said. "She felt like the comedic arts were so important to her and so important to everyone's lives that that's really what Jamestown should do." A groundbreaking is planned during this year's annual Lucille Ball Comedy Festival, scheduled from July 30-Aug. 2. There are plans for an array of interactive experiences that will help visitors see humor in a way they never have before, both that of the comedic greats and their own personal brand of funny, Barton said. "You want it to be an incredible revelation about both what makes things funny and why you're funny," he said.